Last week we spent a lot of time in the office entering data and make sure it is on time. This was a little bit of a challenge due to the fact that we need to be in the field for several hours to complete macro surveys as well. This is the beauty of my job I guess, the fact that I’m not always behind a desk and I’m not always in the field (but the field is always better). To be able to see things first hand or touch or feel and be able to put what you’re doing into context well that is what makes surveying for shorebirds and digging through the mud or hiking 10 miles a day is what makes my job worth it in the end. Some amount of paper work has to go along with any job really and that’s not a big deal as long as it gets done in time with every thing else, but sitting in front of a computer for me is like a little bit of a time out. That’s why I will work hard for 30 to 45 minutes and take a little break walk around for a few minutes and maybe get some thing to drink and then go back to the computer for another 30 or 45 minute run until the job is done. This is one trick I like to use so I don’t get sleepy or tired of what I’m doing and the work can be completed. Even with last weeks mix of office and field work we did see a few avocet nests with some eggs! On my weekend I also saw a Killdeer nest with 3 eggs and they were a sight to see so colorful. 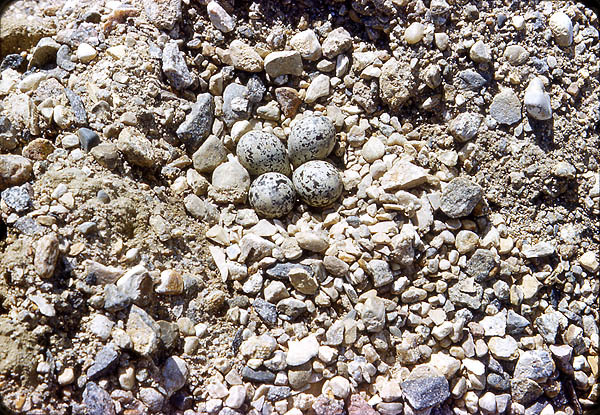 The only problem is those dang Killdeer always seem to put their dang nest right in the middle of a rocky road down here in the San Louis Valley. It’s a wonder how we have Killdeer here at all!